Many factors should be considered when choosing Easter brunch ideas. Especially on Easter, events might help to determine exactly what you choose to serve on your menu. Many people will be attending a church service (or church services) Sunday morning. You may need to fit your entertaining in between these events. If this is what you are facing, you may choose to serve a selection of breakfast breads like hot cross buns which can be baked in the days prior to Easter and if desired can be quickly warmed before serving. Of course, you must offer coffee, tea and juice; a bowl of fresh fruit with a side bowl of fruit dip will also be appreciated so be sure to include all these beverages in your Easter brunch ideas. A yogurt fruit dip recipe goes quite well with fresh fruit for Easter morning. It is simple to make and the light lemon ginger flavor makes it simply delicious. In a small bowl combine 8 ounces lemon yogurt with 8 ounces sour cream. Blend in ½ teaspoon lemon juice, 1 teaspoon ginger and if desired a little freshly grated lemon peel. Cover tightly and refrigerate about 1 to 2 hours to let the flavors blend. This is great with any of your favorite fresh fruits. Now before going on with more Easter brunch ideas, let me back up a little. As usual when entertaining let me stress presentation; for a simple buffet like I mentioned it doesn’t have to be fancy. A tablecloth for me is a necessity anytime you entertain. In this case I feel you can get by with even a pretty paper one for the occasion; just enliven your table. A simple table decoration will help and make sure napkins, utensils and condiments are available. If you are looking for Easter brunch ideas and have more time to enjoy it then you will want to add a few Easter breakfast recipes to the menu like a quiche Lorraine or French toast. If you are still focusing on morning entertaining, there are many recipes for egg casseroles which are delicious and always a favorite at brunches. I would also add a platter of thinly sliced ham pieces, crisp bacon and sausages, either small patties or small links. In addition, add another bread that is not sweet; like bagels or biscuits. Remember as in this case when you need utensils to eat from your plates (anything more than finger foods) you will need to provide table space for your guests to sit and eat. These scrambled egg muffin are great individual servings for Easter brunch ideas. Flatten bread slices with rolling pin; spread 2 tablespoons butter on 1 side of 8 slices. Press buttered side of bread down in 8 muffin cups. Bake at 350F degrees for 12 to 15 minutes until lightly browned. Remove from oven; increase oven temperature to 465F degrees. Melt 2 tablespoons butter in large skillet; add beaten eggs and chives. Cook eggs over medium low heat until softly scrambled; fill bread lined muffin cups with scrambled eggs. Top scrambled egg muffins with sliced sharp Cheddar cheese; return to hot oven until cheese is melted. Breakfast casserole recipes are always good for Easter brunch ideas. Brown sausage in Dutch oven stirring occasionally to keep it broken in small pieces. Add onion, green peppers and mushrooms; stir in hash browns and cook 10 more minutes. Mix milk with eggs and pour over mixture; stir to blend. Bake in oven about 20 to 25 minutes or until eggs are firm. Top with cheese and bake until cheese melts; serve with salsa. True Easter brunch ideas are for a combination of breakfast and lunch ideas. I would suggest these when there is plenty of time to leisurely enjoy the meal. This expanded menu is meant to please both those guests who are ready to have breakfast and those guests who are ready for lunch. To the previous sweet breads, rolls, breakfast meats and eggs, let us add some items that you would consider more for lunch. 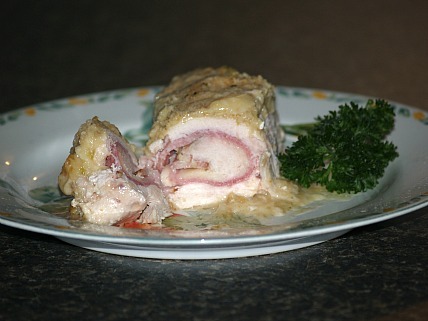 The chicken cordon blue recipe below is always welcomed by guests; they are prepared in individual servings and are very convenient. Colorful salads add appeal to the table as well as being very tasty and the Yorkshire pudding popovers recipe is a great alternative to sweet breads. Individual servings like this Chicken Cordon Blue recipe work well for Easter brunch ideas. Pound out boneless chicken breast until evenly about ½ inch thick; cut each breast in half. Place a thin slice of Swiss cheese and a thin slice of ham on each half of chicken breast. Roll up in jelly roll fashion. Dip rolled chicken Cordon Blue in egg batter and roll in Italian bread crumbs; place in lightly greased baking pan and drizzle each with melted butter. Bake in a preheated oven at 350F degrees about 40 to 50 minutes or until chicken is tender. Great topped with a mushroom sauce or cheese sauce. The is a great recipe for Easter brunch ideas. Mix together flour, eggs, salt and milk; slowly add water while beating. Spay 12 muffin tins with no stick spray; heat tin in oven until hot. Pour batter into each hot muffin tin almost to top; bake 20 minutes or until brown. Below you will find a selection of special sweet breads or you might call them coffee cakes. Each one of these recipes is exceptionally tasty for Easter brunch ideas. The first one is filled with a great combination of apricots, prunes and pineapple offering a wonderful flavor. The next one is a favorite of a Jewish friend of mine; has butter, brown sugar, cinnamon, nuts and a hint of chocolate. How delicious! The next one is for sticky buns and I am sure I don’t have to say anymore about those. I saved the easiest for last; made easy with a cake mix and canned filling. These are all good and I hope you will enjoy them for your Easter brunch ideas. Combine flour, 2 tablespoons sugar and salt in a large bowl; cut butter into flour mixture with pastry cutter. Combine yeast mixture, egg and vanilla; stir into flour mixture blending until smooth. Turn dough out onto floured surface; roll into 10 X 14 inch rectangle. Place dough into lightly greased 7 X 11 X 2 inch baking pan allowing extra dough to hang over sides. Spread fruit filling over the dough; fold overhanging dough over the fruit filling. Sprinkle the dough with 1 ½ Teaspoons sugar; immediately place in preheated oven at 375F degrees. Bake 30 minutes; reduce heat and bake 15 to 20 minutes longer or until lightly browned. Cook prunes and apricots in a small amount of water until tender; drain. Combine fruit mixture with pineapple, sugar and tapioca. Cook and stir over low until blended and thickened. Preheat oven to 350F degrees; grease and flour Bundt pan. Cream butter and sugar together until light and fluffy; add eggs and sour cream and mix well. Sift baking powder, baking soda, salt and flour together; add to creamed mixture. Blend in vanilla and set aside while preparing filling. Combine all ingredients for filling and blend well. Pour ½ of batter evenly in prepared Bundt pan; add filling then rest of batter. Beat sugar and eggs until creamy; beat in 1 cup butter, salt, hot water and dry yeast. Add 2 cups of flour and beat in with spoon; let rise until double in bulk. Punch down, cover with moist towel and refrigerate until dough is workable (1 to 2 hours). Prepare two 9 X 13 inch baking pans; melt until bubbly 1 cup butter and brown sugar. Spray bottom of pans with non stick spray; pour butter, brown sugar mixture on bottom of pans. Take out half of dough and divide in half again; roll to the 9 X 13 size of pan. Brush dough with melted butter and sprinkle with a cinnamon sugar mixture. Roll up the long way making 13 inches long (jelly roll style) and seal. Cut in thirds and cut each third in 4 parts ending with 12 rolls from each quarter part. In the same way prepare the other 3 quarters and place in prepared pans. Allow rolls to rise until double in bulk or 1 hour. Preheat oven to 375F degrees; bake 20 to 25 minutes. Cool 10 minutes and turn upside down on tray scrapping the syrup from the pans. In a small bowl combine 1/3 cup chopped walnuts, sugar, flour and butter; set aside. In a large bowl combine cake mix, sour cream, water and eggs; mix on low until blended then on high for 2 minutes. Spoon 3 cups batter into prepared pan; spread raspberry filling over top. Sprinkle remaining nuts evenly over raspberry filling; top with remaining batter. Sprinkle nut mixture in small bowl evenly over top. Bake at 350F degrees for 40 to 45 minutes or until pick comes out clean; cool completely.